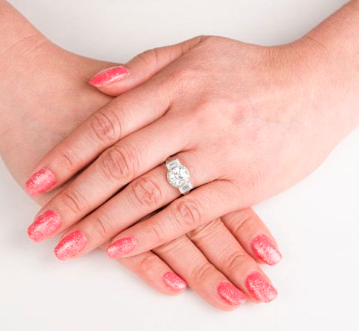 The average cost of an engagement ring in the USA is $5,000, but that doesn’t mean you can’t dream or splurge. 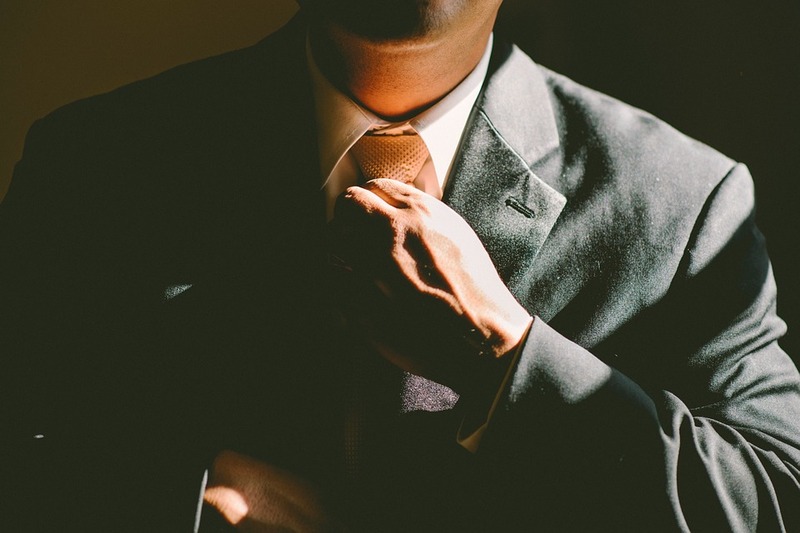 Ultimately what you spend is up to you and your budget. 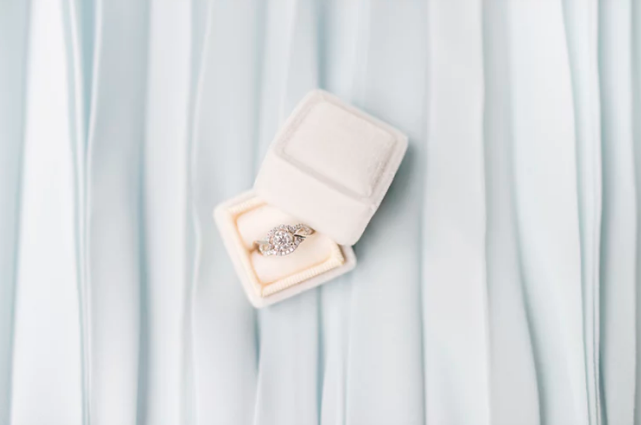 If you are looking for a stunning and high-end ring for your loved one or perhaps you are daydreaming about a vintage engagement ring, then this selection is sure not to disappoint. 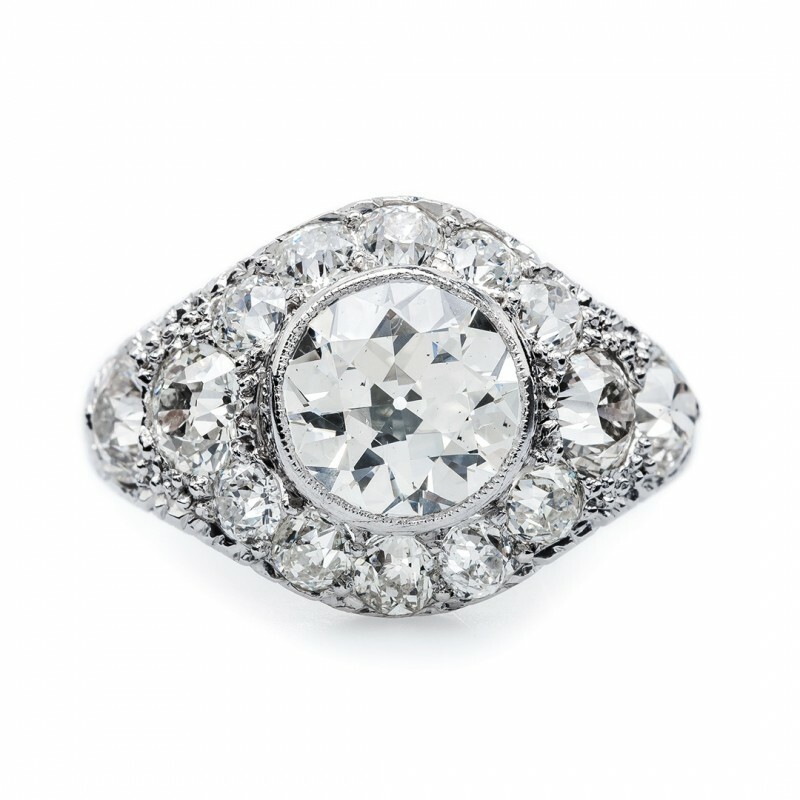 Here are the 20 most beautiful vintage engagement rings over $20,000. 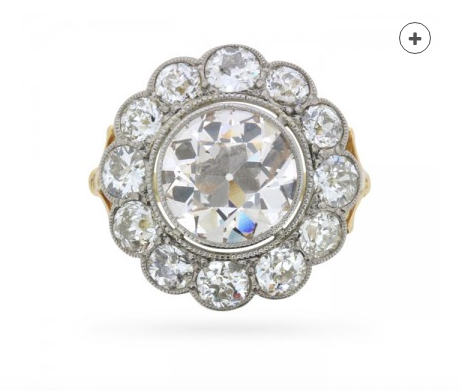 Vintage rings are exceptional for their unique designs and intricate details. 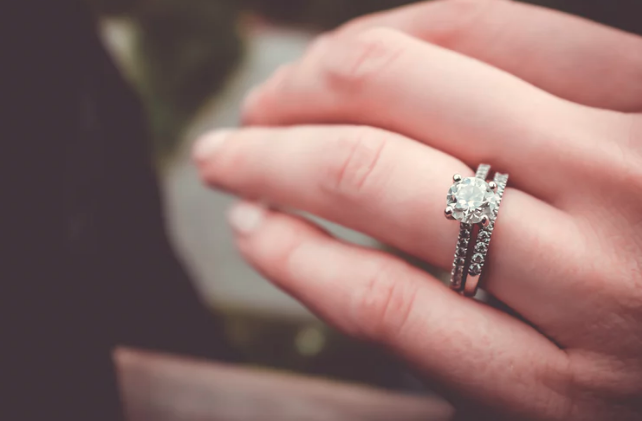 Depending on the period they were created in, vintage engagement rings can also be rare, making them a one-of-a-kind gem for your fiancée. There are seven different eras that each has a distinct statement and style, including the Georgian (1714-1830), Edwardian (1900-1915), Art Nouveau (1915-1985), Art Deco (1915-1935), Retro (1953-1950), and Modern (1950-present). It’s important to keep in mind that some of these choices along with vintage rings in general, that they usually have limited availability. This limit means that a jeweler might only have one of that particular ring in stock or it’s the only one of its kind in existence. 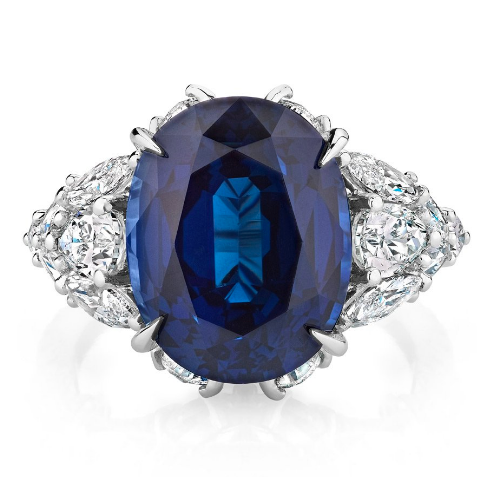 This deep blue sapphire is set in platinum along with a layered marquise and pear diamonds. It’s 2.65 carats and priced at $27,500. This 5.14 carat diamond is surrounded by another 0.25 carats and platinum. It dates back to the Edwardian Era–around the 1920’s– and is priced at $78,500. 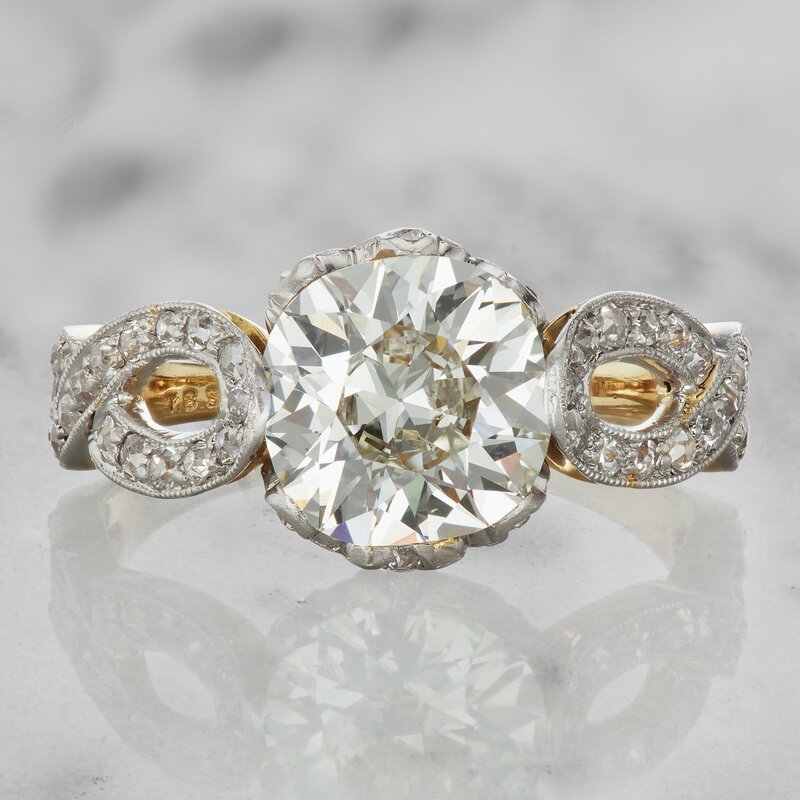 Created in France during the Art Deco Era of 1930, this 2.19 European cut diamond is accented by baguette-cut diamonds and a halo of antique diamonds on the gold and platinum mounting. This platinum 4 carat diamond ring with baguette siding was created in the Art Deco Era of 1930 and is priced at $37,050. 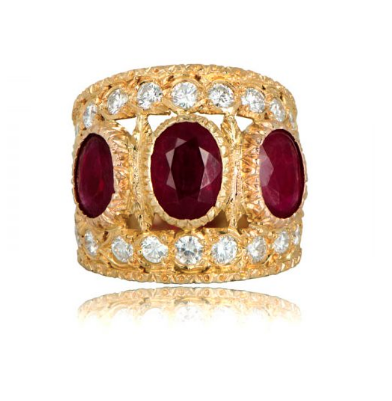 With a unique charm, this ruby is set in 18k gold and adorned with surrounding diamonds and handcrafted engravings. It was made in 1960 by M. Buccellati in Italy and costs $32,000. 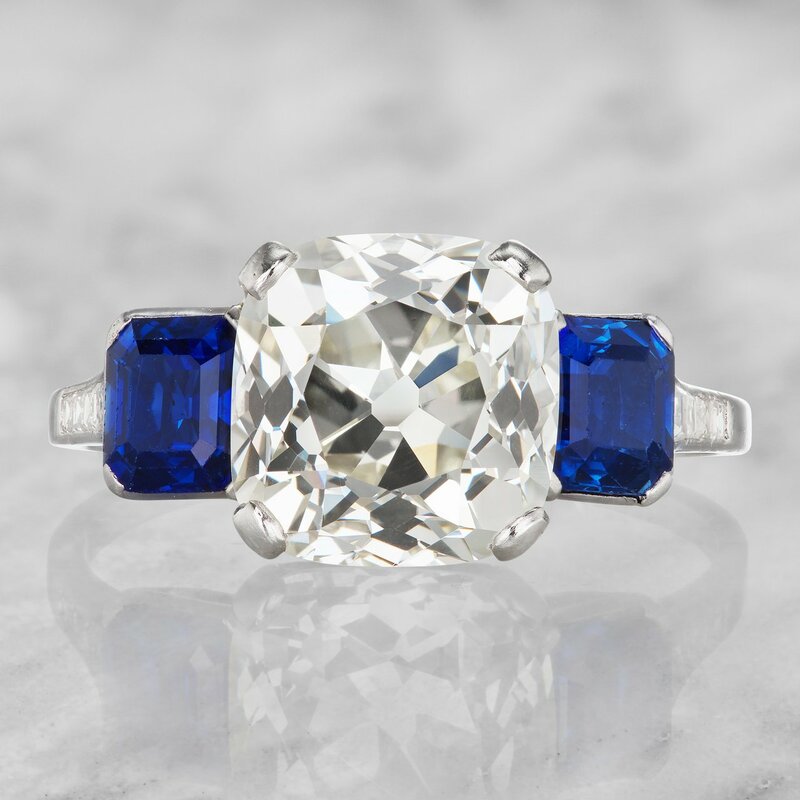 From the Art Deco era circa 1920, this 4.21 carat three stone ring is surrounded by dazzling sapphires and diamonds. Priced at $59,900.00. 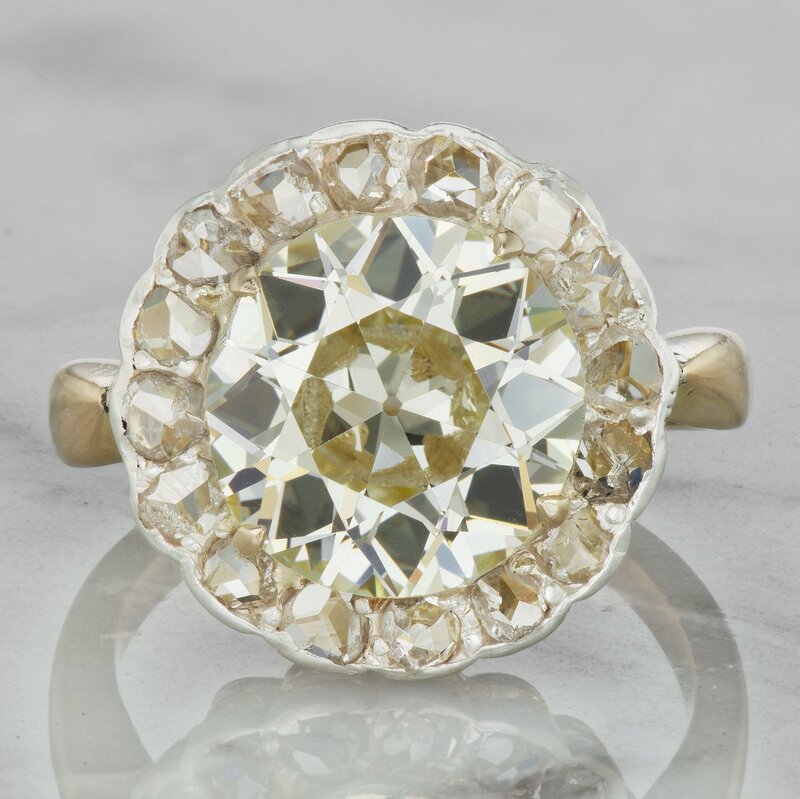 The Lana Ring is from the Edwardian Era, circa 1910 and features a 4.25 carat old European cut diamond priced at $38,900.00. 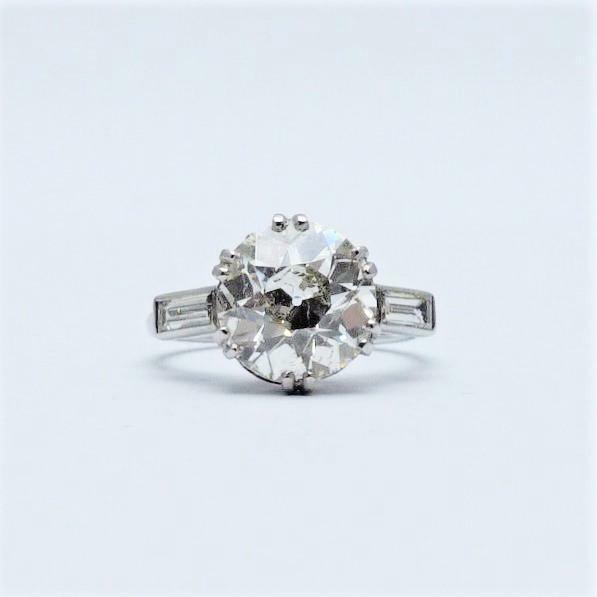 From the Art Deco, circa 1925 this platinum and 1.85 carat old European cut diamond ring is $21,250. 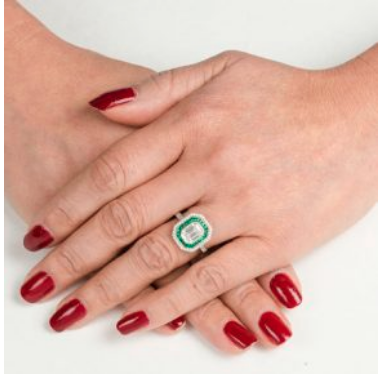 At $21,200, this Art Deco Era platinum reproduction ring holds an old European cut diamond with a double halo of diamonds and French cut emeralds. 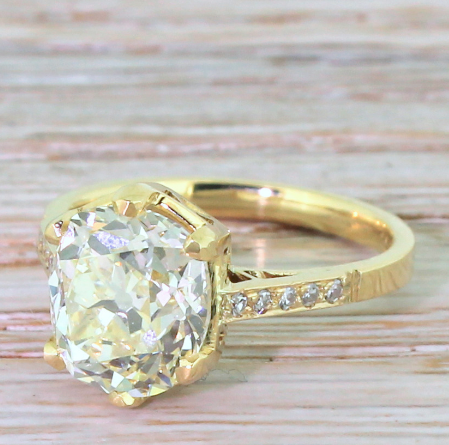 The central diamond solitaire weighs in at hefty 3.66 carat with a distinct yellow hue from the mid-Victorian era. It’s priced at $34,000. The Azara Ring is from the late Edwardian era, circa 1915. 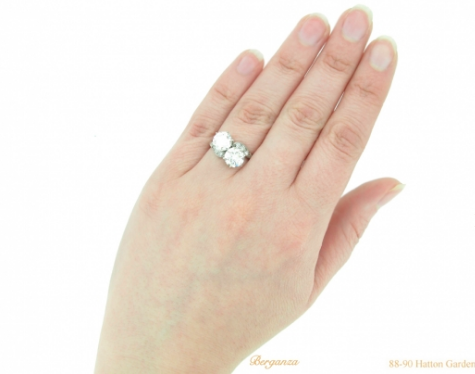 It holds a 2.22 carat transitional cut diamond set in platinum and priced at $21,900.00. 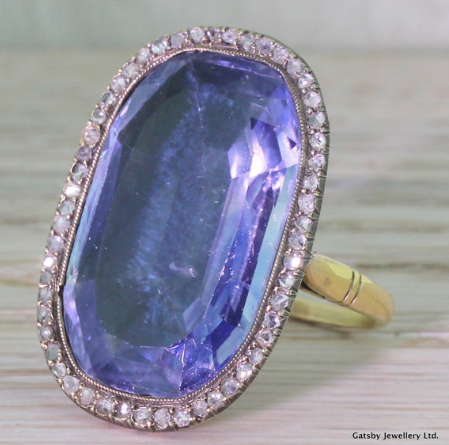 This gorgeous blue Ceylon sapphire is 25.30 carat, surrounded by 54 rose cut diamonds, and priced at $34,000. A gorgeous and brilliant European-cut diamond, weighing in at 2.02 carats with a price of $21,500. This 18 carat yellow gold and platinum ring features a 6.30 old cut diamond ring cluster. It dates back to 1910 and is selling for $50,940. This rare Victorian era engagement ring is from the 1880s, and showcases a gorgeous triad of old cut diamonds that total to 3.80 carats. It’s listed at $32,700. 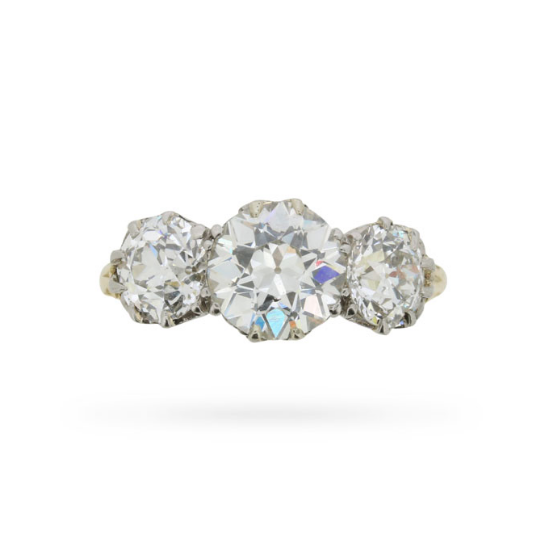 At $32,585, this 1940s ring is set with ring two adjacent round old cut diamonds, each having a weight of 1.45 carts and 1.37 carats respectively. 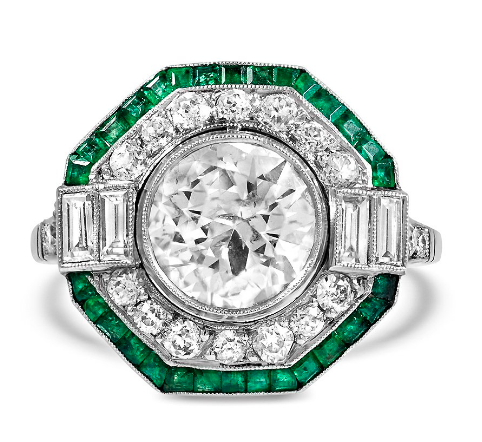 At $26,00 this beautiful ring features an emerald-cut 1.72 carat diamond. 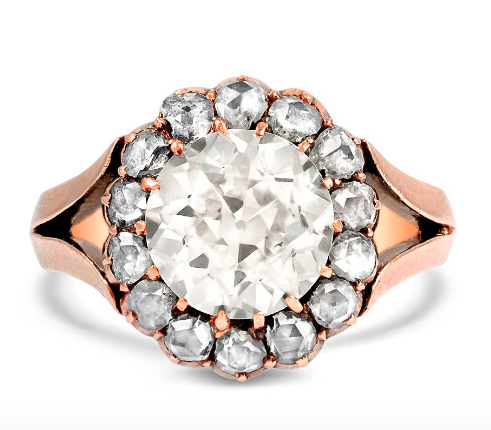 With $20,850 price tag, this divine 18K rose gold Victorian ring is set with a 2.80 carat old European cut diamond. 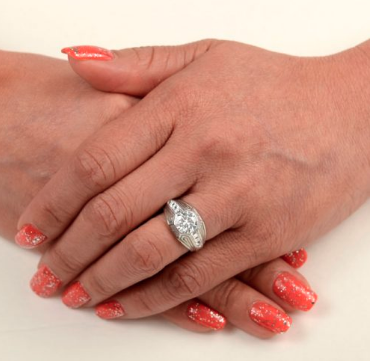 Ballinger is handmade platinum ring with a 1.60 carat diamond. 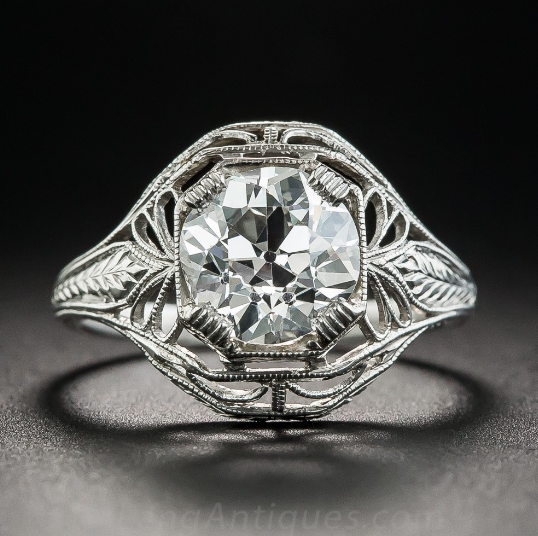 Dating from an authentic Edwardian era (circa 1915) this ring is $22,300. 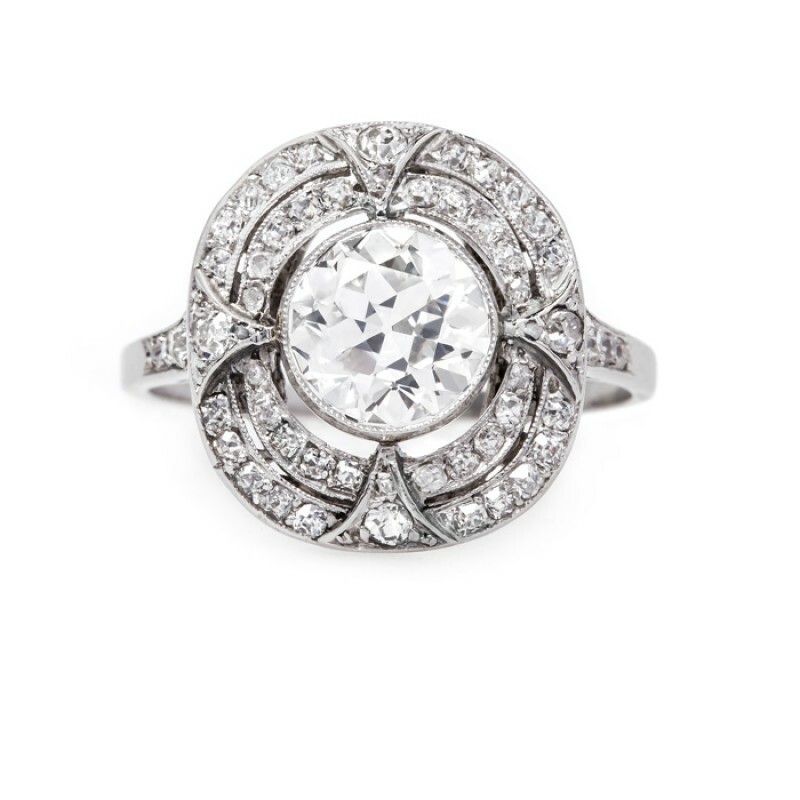 Handcrafted in the early 1900’s, ring holds a 2 carat centered diamond and is accented by French-cut diamonds. It’s priced at $22,500.00. 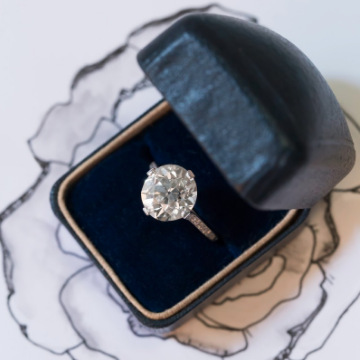 There is nothing quite as unique as finding a remarkable antique engagement ring in our modern world! Explore our selection of 20 of the most beautiful engagement rings over $20,000 for inspiration in your jewelry choice or to put on your wish list.